American researchers may have revolutionised the field of artificial limbs by adopting a new power source formerly used mainly in torpedoes and rockets. 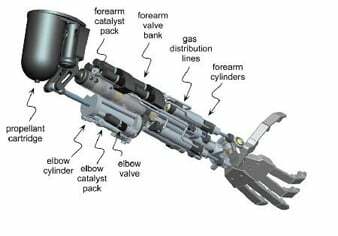 Prosthetic robot arms have been on something of a technological plateau for a while. Myo-electrics - in which functions can be controlled by muscle movement in the remaining limb - came in decades ago, but other than that the limbs have stayed relatively primitive. Now, however, due in part to the substantial numbers of Western troops severely injured in Southwest Asian fighting, fresh ideas are circulating. New methods of control, perhaps better or more flexible than ordinary myo-electrics, are under consideration, and rather than essentially being a powered claw, much better-articulated limbs are being developed. Some of these initiatives have been funded by DARPA (Defence Advanced Research Projects Agency), the occasionally somewhat foam-lipped US death-boffin outfit. Only one thing has been lacking - new power sources to drive the more sophisticated limbs under development. Fit young men - and most military casualties are from this group - expect their arms to be powerful, able to grip and lift 30 pounds or more quite quickly. But existing battery-powered limbs, if built to this sort of spec, either become unacceptably heavy or run out of juice much too fast. A proper cyber arm, rocket fuelled and steam driven. Enter Professor Michael Goldfarb of Vanderbilt University. "Battery power has been adequate for the current generation of prosthetic arms because their functionality is so limited that people don't use them much," Goldfarb says. "The more functional the prosthesis, the more the person will use it and the more energy it will consume." Goldfarb reckoned that current battery tech was never going to offer an arm with decent strength and endurance at a reasonable weight. He'd previously run up against these limitations working on a DARPA exoskeleton project, and he reckoned he had the solution: the arm needed to be powered by a small rocket motor. No, really. Goldfarb's design uses high-test hydrogen peroxide fuel, formerly used mainly in rockets and torpedoes. Concentrated peroxide breaks down in the presence of a catalyst to produce high-pressure steam and oxygen. In Goldfarb's arm, the vapour is used to drive pistons, just as in a steam engine: but rather than turning a wheel, the various pistons heave in or let out tension belts against springs so as to bend or straighten the elbow, wrist, fingers, etc. According to Goldfarb, a small sealed canister of hydrogen peroxide that easily fits in the upper arm can provide enough energy to power the device for 18 hours of normal activity. There have been a few little problems, though. The steam comes out of the generator unit at oven-like 230-degrees-C temperatures, making parts of the arm baking hot. But Goldfarb and his team have used strategically-placed insulation "to reduce surface temperatures enough so they are safe to touch". An initial tendency to hiss and chuff noisily was fixed, too. Then there was the matter of the arm squirting jets of damp steam exhaust like a old-time locomotive; but again, Goldfarb figures he's got this sorted. Waste steam is disposed of discreetly, "in as natural a fashion as possible: by venting it through a porous cover, where it evaporates like natural perspiration", according to the Vanderbilt inhouse magazine article (includes video of the arm operating on compressed air.). "The amount of water involved is about the same as a person would normally sweat from their arm in a warm day," Goldfarb says. This doesn't seem totally convincing overall. Many of us have suffered from visibly damp armpits, but actual jets of steam blowing from them might be a tad embarrassing - if perhaps more fragrant than ordinary biological emissions. At least, as long as the fuel itself doesn't leak. Then there are a few other questions to be asked. Pressurised high-test peroxide (HTP) isn't like the friendly low-concentration bleach beloved of ersatz blondes, safe for handling by hairdressers and the like. This stuff is corrosive and explosive, and HTP accidents are thought to have sunk submarines and led to various other deadly mishaps. Furthermore, peroxide-driven machinery usually needs intensive maintenance to remain even vaguely safe - perhaps unsurprisingly, even the working parts being driven by a fairly corrosive and saucy mixture of hot steam and oxygen. An arm which requires poisonous hazmat fuel and which offers at least some chance of an explosion or violent mechanical failure in use could be seen as going too far in pursuit of decent power and endurance. Still, the military users DARPA is aiming at are reported to love the Terminator-style look of some new artificial arms. If they like cyberpunk style, there's at least a chance they'll love Goldfarb's steampunk* offering. Even so, Goldfarb is apparently a bit worried he might lose his DARPA funding soon due to concerns over how long it could take to get regulatory approval for the HTP-powered steam arm. But he reckons other backers will step in if DARPA cut him off. *A speculative-fiction genre based around steam technology which never developed in the real world, among other things.